ta dah! 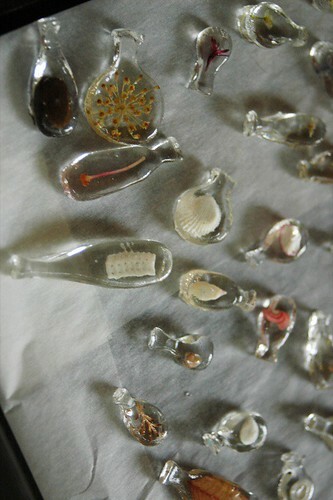 here they are (sort of), organic shapes of clear resin with little wee bits o' nature tucked inside. i still need to let these cure a bit and then wrap silver wire around the fluted bit to make them into pendants. these have been a very long term project as i first made resin shapes with little bits in them back in 2003, when i was living in bendigo and had way too much time to kill. 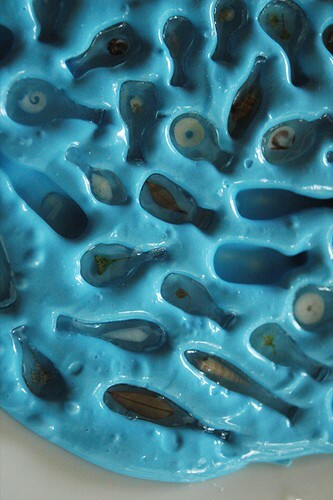 i made latex molds that time and the resin never really set properly. i had all these lovely little pieces in a plastic container, edges too soft to really do anything with, for over a year until they cured. i ended up designing cards using them on the front and they were a great little seller for me at the 2005 vancouver gift show. ANYWAY, i had the brainstorm to change the shapes a bit, make them fluted on the top so that wire could be wrapped around and they could be worn as jewellery (what i originally intended them for anyway, i just hadn't really worked out if i was going to drill through them or what). these are so fun, if a little bit stinky and toxic, to make. i love collecting little bits to use in them - shells, tiny leaves and flowers, broken coral, gum nuts and seedpods... you can see some of my collection of these things here, here and here. and, as promised, everyone who guessed on the last post (up until flossy-p yesterday at 3:30pm) will be getting one of these pendants in the mail (morsey and prue, you can have yours straight up)! 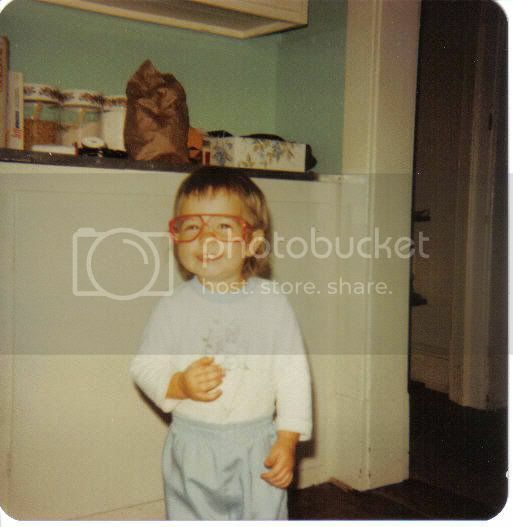 thanks for playing along, everybody! i'll be contacting you directly in the next day or two to get your addresses and i should have them ready to send out next monday. i'll post another photo when i get them wrapped and in better light. Oh wow! Those are gorgeos pendants!! And I love that the "mysterious blue thing" was the mold--never would've guessed that in a million years. lol. Brilliant! what an awesome idea. They look gorgeous. What are the shapes that you made the mould out of originally made from? Fimo or something? Making stuff out of moulds looks like so much fun. thanks lara! yep, i used sculptey to make the shapes. i might try to find something else next time though as the sculptely was pretty prone to fingerprints which the mold, and then the resin, picked up. Ohmigod, you are so clever- I would never have guessed that! They look fantastic. Wow - they're lovely. So teeny and delicate. I really had no idea that they would turn out like this! Very nice. I love the shapes. They are like little bottles or fish or flotsom and jetsam. What a delightful pendant idea! I love your collections of shells, I collect too-my bathroom is beach themed so we have alot of shells, which I just adore. Looking forward to receiving one! What absolutely cunning and beautiful little treasures! I think these are just gorgeous. They ARE gorgeous! 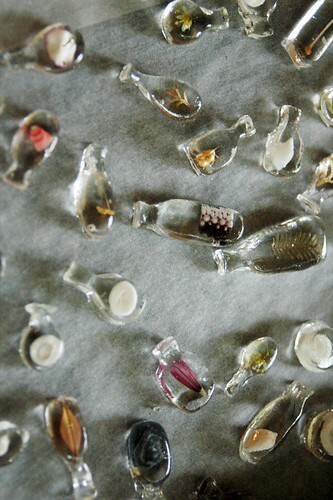 Like tiny specimen collected in jars and bottles by a botanist exploring a new land! oh my gosh. these are breathtaking! they make my heart beat a little bit faster. me again, I use a non-toxic resin called Clear Cast it works on a 50 50 basis so super easy to work with. I love this mold! I have never used a handmade mold but have been wanting to try.